THIS YEAR IN AN ALL NEW FULL COLOUR DESIGN. THIS YEAR WITH SOME NEW WORDING. THIS YEAR IN 3 NEW STUNNING EDITIONS. Will you fry when you die? For the lucky and blessed, pay more die less! For L-13 chancers and connoisseurs. ALL CONTAIN RANDOMLY SELECTED DATES CIRCLED IN RED. PERHAPS THE DAY YOU DIE? MAKE YOUR CHOICES AND TAKE YOUR CHANCES! These calendars are advisory only – no action should be taken. 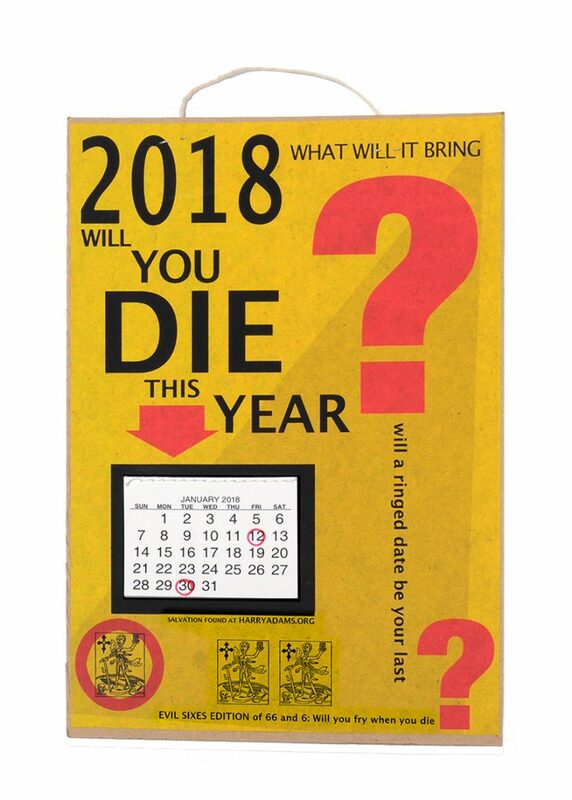 These calendars are not magical in any way and and have never been known to work. Any death coinciding with a ringed date is entirely coincidental. DO NOT buy one if you are in any way superstitious. DO NOT give one to friends or family who are in any way superstitious, sensitive, or easily alarmed. DO NOT buy any for your enemies. It won’t work. If you do die by mistake on a selected date we’ll issue you a full refund and a written apology. Click the images to go to the L-13 shop.